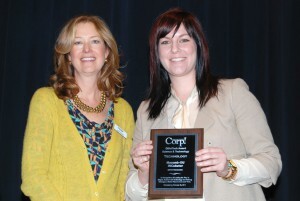 The Macomb-OU INCubator recently took home a technology award from the 2015 Corp! Magazine DiSciTech Awards. This award exemplified how Mac-OU INC helps small businesses grow by creating customized success strategies for startup and emerging companies in the niche industries of defense, homeland security, advanced manufacturing and technology. We’re so grateful to have been honored with a technology award from Corp! Magazine. This award recognized our support of small businesses and we couldn’t be more proud! Winning an award is always gratifying, but the credibility a company earns in respect to the award is even more important. Small businesses should pay special attention to this aspect of awards. There is no question that it is difficult to launch a business, become recognized and prove a business’s worth. Awards, especially those focused in a business’s industry, can ease up those difficulties. What is your business? Awards are a great way to give your company the center stage. You’re on your way to achieve greatness and now people will know your name. Why are you any better? Awards demonstrate that your company was selected to be honored above others companies. You were highlighted for a reason. The award alone sets you apart from others in the same category. Prove it. Beyond the taking the spotlight at an awards ceremony, your award has stamped your company with credibility. An award is not just an achievement, but it’s also an answer to those questioning your company’s worth. There are business awards given out for an immensely vast variety of honors. There’s an award for every company’s industry, location or scale. Filling out applications takes some time but it is well worth it when you walk across stage to receive your award. Startups need all the credibility they can get. Do a Google search or ask around and you’ll find that there are a bunch of awards for every business!